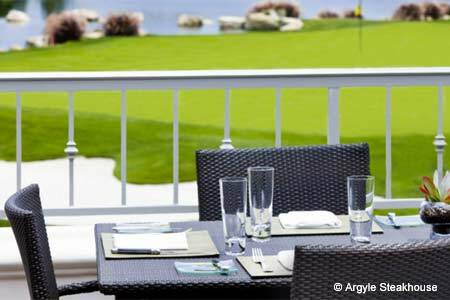 Steak and California fare at the Aviara Golf Club. Breakfast Sat.-Sun., Lunch Tues.-Fri., Dinner Tues.-Sun., Brunch Sat.-Sun. : Argyle Steakhouse at the Aviara Golf Club is not your typical "19th hole" hangout but a full-fledged destination restaurant offering warm popovers with romesco in lieu of bread and a twelve-page wine list and innovative craft cocktails. Enjoy the view of the links and the Batiquitos Lagoon from the patio or the dining room. Chef Kurtis Habecker (L'Orangerie, Aubergine) has been manning the stoves since 2006. Start with the Dungeness crab and shrimp salad designed to resemble an ocean vista with yogurt as waves and Old Bay crumble as sand. The selection of California natural Prime beef and American and Australian Wagyu features well-known sources such as Brandt Beef and Snake River Farms. A sauce or crust is included, with Cognac and green peppercorn sauce the most popular, but the meat more than holds its own alone. Diners that have a beef with beef can still enjoy seafood paella featuring large shrimp and a kick courtesy of piquillo pepper. More traditional sides include three types of potatoes. Try the chocolate cake with Tahitian vanilla gelato for dessert. Salads, sandwiches, pasta and more California cuisine are available during the day while burgers and ribs are options on the bar menu. Hotel guests should utilize the free shuttle service between the restaurant and the Park Hyatt Aviara Resort, especially on the contented post-meal leg.